1. Preheat oven to 325°. In large bowl, toss potatoes and oil until well coated. Mix in garlic, parsley, tarragon, thyme, salt, pepper and oregano. 2. Spray rimmed baking pan with nonstick cooking spray. 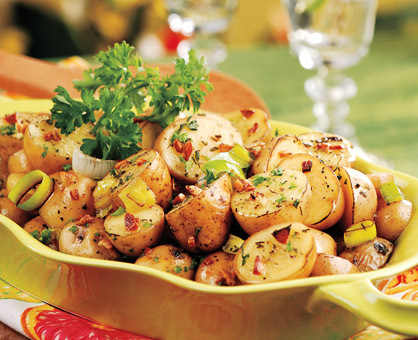 Place potatoes in single layer on prepared baking pan. Roast potatoes 20 minutes. Stir in leeks and roast 1 hour to 1 hour 10 minutes longer or until potatoes are tender and golden brown, stirring occasionally. The oil, garlic, dried herbs and seasonings may be mixed a day in advance and refrigerated. Make this dish gluten-free by using gluten-free nonstick cooking spray.